New giveaway full serial license key for Ashampoo Photo Commander 15. Software on the giveaway is not newest version because Ashampoo Photo Commander 16 just released to public. The Ashampoo Photo Commander license key on this freebie is active for 1-year only. If you need lifetime version, upgrade the license key because Ashampoo offer 75% discount for upgrade. Besides the new giveaway, old offer free license key for Ashampoo Photo Commander 12 active for alternative. 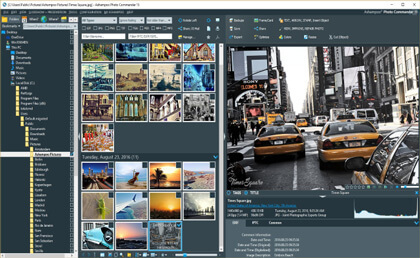 Ashampoo Photo Commander is ultimate photo manager with a huge tools. It help you to edit, organize, and share digital image with ease. Software on this giveaway also allow you to manage/organize audio and video files. Ashampoo Photo commander 15 features with many useful tools including red-eye removal, slideshow creator, and more. Now, license key for Ashampoo Photo Commander 15 and 12 is 100% free. Download if you are interested. Download the full software for free on this offer. Before offer expires, get Ashampoo Photo Commander 15 with genuine serial key. Registration Link for Ashampoo Photo Commander 15: Register here! Download link installer current version: Download the installer!. Downlaod full license key of Ashampoo Photo Commander on this giveaway. To get the software for free is so easy. Just follow the steps describe below. Visit/open the registration page above then enter your email then click on “Request Full Version Key” (It requires an Ashampoo account). And follow the next instructions. After receiving the registration code, download installer the software from the link above [Size ~ 258MB]. the software on your PC and activate using your Ashampoo Photo Commander 15 license key. Old giveaway Ashampoo Photo Commander 12 is still active. It for alternative if your PC or Laptop using Windows XP or Vista because new version not support old Windows versions. You can receive the Ashampoo Photo Commander license key soon after submit the form. Why is Ashampoo Photo Commander is very useful for you? Ashampoo Photo Commander help you to manage a huge numbers of photo collections with ease. It features with browser function, correction, color optimization, and many useful features. The giveaway version is not the latest. You can get new version of Ashampoo Photo Commander 16 with full license key with 75% off price. The offer is available using Ashampoo Photo Commander coupon.